Don’t miss the chance to meet a unique monarch at Vegas Spins with The Monkey Prince Slot! It is a beautifully designed game by IGT you can enjoy on a PC, tablet or mobile device. It comes with 5 reels and 60 paylines, as well as brightly coloured graphics which seem lifelike. Revisit the story of Sun Wukong, a Monkey King featuring in ancient legends dating back to the Song dynasty. He is also a character in movies like The Monkey King, The Forbidden Kingdom or Journey to the West: Conquering the Demons. Travel to the ancient times with the following symbols on the reels; Lions, Dragons, 4 types of Jewelleries, A, K, Q, J, Blue, Red and Yellow Masks. Get right into the action on The Monkey Prince Slot by selecting one of the bet values on the respective field. You can now click on the Spin tab to launch the game. Join the friendly Monkey Prince while you spin the reels. Don’t forget the Auto Play feature if you wish to set various automated rounds played without any intervention. Bet Levels: There are no levels available. Amount of Paylines Selection: The 60 lines are all active during each round. Coin Values: Choose bet values varying from £0.60 to £1200.00. Random Wild Reels: When 3, 4 or 5 scattered symbols show up, receive 10, 15 or 25 free spins, as well as a maximum of 5 Wild reels on every spin. Scatter Wilds: With 3, 4 or 5 Scatters, you can earn 25, 30 or 50 free spins, along with a maximum of 4 Wilds per spin. Surrounding Wilds Feature: Land 3, 4 or 5 Scatters to trigger 5, 10 or 15 free spins, with 1 Random Wild and surrounding positions being converted into Wilds on each spin. The Golden Wild Logo plays the role of a Wild on The Monkey Prince Slot and chips in for any other symbols apart from Scatter and the 3 Masks. When the Surrounding Wilds Feature is active, you are required to fill the meter for each mask. When you manage to fill it completely with an identical mask, one of the Wild features is activated. Five Yellow Masks generate the Surrounding Wilds which replace one random position, with the other symbols turning into Wilds. Five Red Masks on the reels of The Monkey Prince Slot help to generate the Random Wild Reels Feature. It is very rewarding as 1 or 5 reels completely transform into Wild, thus creating more possibilities of landing winning combinations. With 5 Blue Masks on the reels, you can enjoy the Scattered Wilds Feature. Three or four random symbols anywhere on the reels turn into Wild. 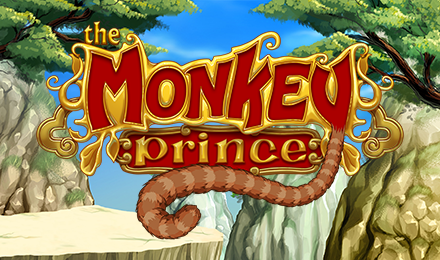 Set the ball rolling with The Monkey Prince Slot at Vegas Spins, where you can also discover other similar games.